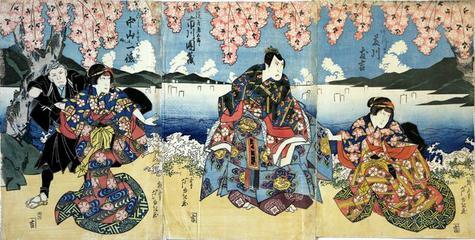 This four-panel composition was composed to commemorate a performance at the Naka Theater in the third month of 1829.
it appears that the original red pigmentation has simply faded almost completely. Reference: Ikeda Bunko, Kamigata yakusha-e shūsei (Collected Kamigata Actor Prints) Volume 1, Ikeda Bunko Library, Osaka 1997, no. 280, pp. 96-97.